Russell Tube Nuts & Tube Sleeves help attach steel or aluminum tubing to 37-degree AN fittings. 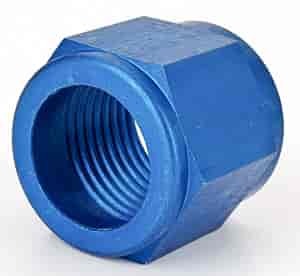 When a flexible hose assembly doesn't work in an application or rules prohibit it, tube nuts and sleeves help fabricate a hard line for connection to AN adapters. Features a high quality blue or black anodized finish or Russell's unique ultra-bright Endura finish that simulates the appearance of stainless steel. Tube nuts and sleeves are sold separately.